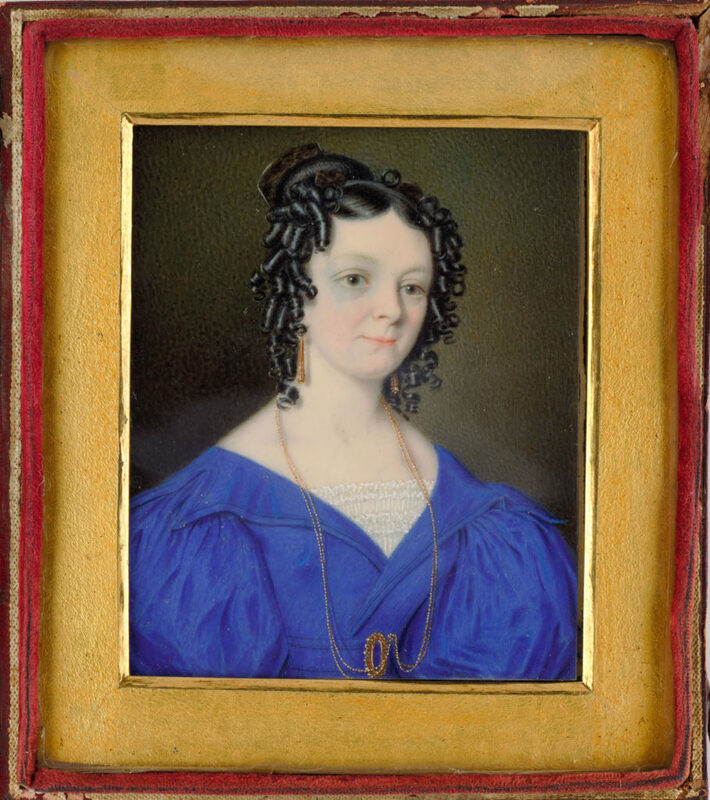 This right facing, ½ length miniature portrait shows Mrs Jane Atkinson (aged 25) wearing a bright cobalt blue [silk] dinner or evening gown typically low-necked and long-sleeved at this time, while ball gowns were short sleeved. In the pelisse-style, wrapping across the front (from right to left) like a coat, the low, wide v-shaped neckline is left partly open to reveal her youthful décolletage, modestly in-filled over the bosom with a shirred muslin ‘tucker’ or chemisette. Its fashionably wide silhouette is extended over the shoulder line by broad notched, or ‘van-dyke’, lapels spreading out over the top of large ‘bouffant’ (puffed) ‘gigot’ (leg of mutton) sleeves. The sitter carries a watch, suspended from a long double-stranded gold chain looped up on either side and tucked into a small pocket on the LHS of the narrow round waistline of her gown, marked by a self-fabric belt fastened with a deep oval-shaped gilt buckle. She also wears long gold pendant earrings. Her glossy black hair is centre-parted and arranged in tight ringlets on the sides, and drawn smoothly back into a high bun at the crown fixed with a [Chinese lacquer ware / tortoiseshell] comb. In mid-Nov 1832, Mrs Atkinson left Sydney with her family to live in Launceston, Van Diemen’s Land (now Tasmania). It is highly likely, therefore, that this portrait was painted in the days just prior to her departure, perhaps as a memento for her mother Mary Reibey – the artist’s dating of this image would seem to bears this out. Jane Penelope Atkinson, nee Reibey (1807-1854), was born in Sydney, the 3rd daughter of Thomas Reibey (1755 – 1811) and emancipist merchant Mary Reibey, nee Haydock (1777-1855). On 11 Sep 1824, aged 17, Jane (known as Penelope) married merchant and auctioneer John Atkinson (1795 – 1893). The couple settled in Wilberforce, NSW, on one of Mary Reibey’s properties, before re-locating to Launceston, Van Diemens Land (now Tasmania) in mid-November 1834. The couple produced 6 children in NSW before 1832, and 12 children in total. Jane Atkinson died (aged 47) at Launceston, Tasmania, on 9 October 1854.